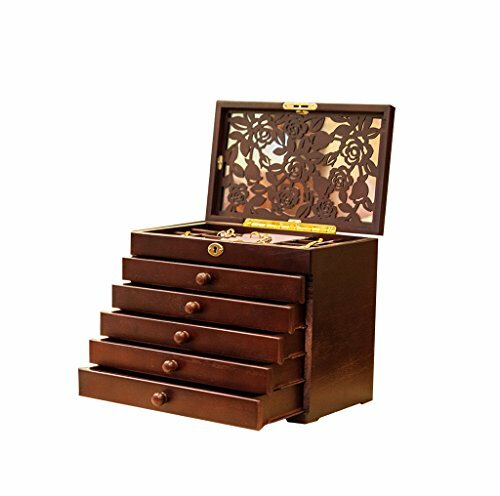 The hand-carved Jewelry Box and lock-6 Layers,5 slide out drawers, 52 compartments. Innovative patented design: Wood latches to prevent drawer slipping when moving , to reduce the risk of broken jewelry. Package include:red gift box,great gift idea! Solid,classic metal hinge,allowing you to securely bring your 'it' so easy and natural. Thoughtful design, the upper clamp ring is available to sponge,fineProtect your belongings heart. Hand-carved,precise and delicate,rich,so lifelike rose. If you have any questions about this product by Legoyo, contact us by completing and submitting the form below. If you are looking for a specif part number, please include it with your message.